At first glance, this photo looks unremarkable. Fred Cantor took it in 1977, he thinks — during the Great Race. That was the fun, funny and often alcohol-infused event in which people dressed in costumes, created their own vessels, ran from Taylor Place to the river, jumped in their watercraft, raced out to Cockenoe Island, filled a bag with garbage (the cheaters already carried pre-packed trash), then rowed or sailed or whatever-ed back to shore. Meanwhile, Main Street merchants held sales. This was the scene outside Remarkable Book Shop. The stalls were always outside, but on this day they attracted huge crowds. The Great Race is (regrettably) long gone. But this weekend the Fine Arts Festival returns to Main Street. It’s a great show. Unfortunately, few Remarkable-type stores anymore offer something else to all those art-lovers (though Savvy + Grace is worth a trip from anywhere). Also this weekend, the Westport Library hosts its 26th annual Book Sale. Those squintillions of volumes make this Remarkable scene look, well, unremarkable. But whenever and wherever people buy books, it’s a good thing. Finally, this Friday Flashback raises the question: Now that Remarkable Book Shop is gone — and Talbots too is a long-ago memory too — will anything ever take their place? 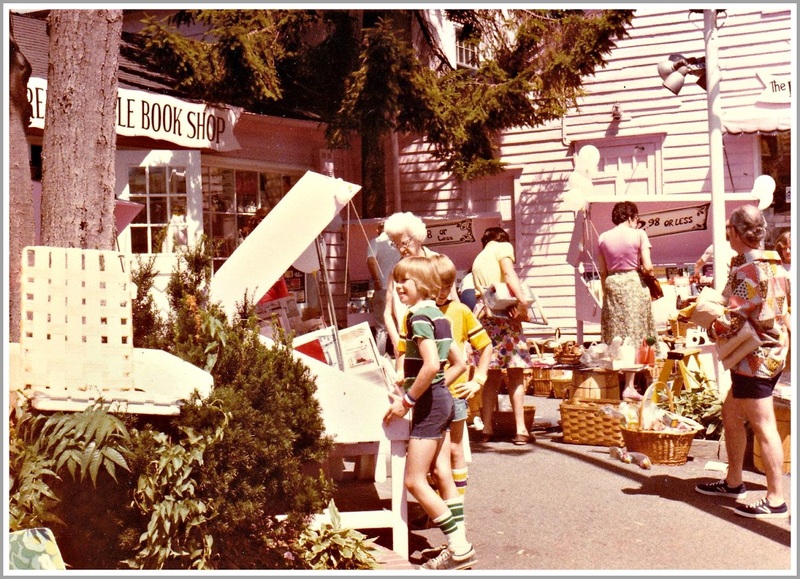 This entry was posted in Arts, Downtown, Friday Flashback, Library, Local business and tagged Remarkable Book Shop, Talbots, Westport Fine Arts Festival, Westport Great Race, Westport Library Book Sale. Bookmark the permalink. mean Ann Taylor (Isabel Elands)which closed a few months ago Talbots started out in the complex where Crateand Barrel is before moving to Main Street. Dan — Thank you for this well timed piece. Let me add that Sunrise Rotary put on the Great Race as a fundraiser, let it lapse and, ten years ago, replaced it with the Great Duck Race. More important than the stores, I want to know when those awesome tube socks are coming back in style!!! The Fine Arts Festival will be bigger and better than ever – now featuring over 180 booths of curated artists, family arts activities, great new music and food features, including Bill Taibe’s KiWaNi! Roz, that’s very cool! I was wondering if someone would recognize the kids or the elderly woman right behind them—and I’m delighted one of the kids in the pic turned out to be an “06880” reader. Roz. Hello. This is Britt Anderson. I flipped when I saw your post, went back to the picture and thought “yes, that is them.” Hope you all are well. Roz, that i SO great! What a fun remarkable pink wonky rambling treasure that place was! I would however like to point out to the author that neither Talbots nor Ann Taylor are anything special esp given they are chain stores. Of the era, lets talk Selective Eye or Soups On or .. help me out here. What were some of the other singular, locally owned and run shops? Remember what as in those stalls before that section of the Remarkable Bookstore took them over? Seth, so the Remarkable’s outdoor book bins were originally installed by the Record Hunter to display and sell vinyl albums? I did my record buying at Klein’s (which is why I guess I have no recollection of that). Interesting. Did someone mention The Great Race? Man, I really love the Town I grew up in, and the way it was – including the Great Race and the Remarkable Book Store – but we have done a pretty good job keeping that vibe alive! Including the annual Art Festival and the book sale.